ww2dbaseLi Zongren was born to a teacher, Li Beiying, in Xixiang Village, Guilin, Guangxi Province, China. He enrolled in the Guangxi Army Preparatory Academy in 1908, and joined the revolutionary cause in Oct 1910. Between 1912 and fall of 1913, he received formal military education at Guilin Military Cadre Training School, emerging a lieutenant in the Chinese Army. 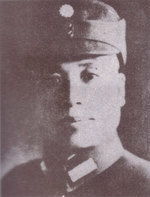 Between 1917 and 1918, he fought in the Constitutional Protection War as a platoon, company, and finally battalion commander, earning the reputation as a brave soldier and able commander after victories in Hunan Province. In 1921, he broke ties with the Nationalist Party and led his troops back to his home province of Guangxi, naming his men the Guangxi Second Independent Army and himself the commander-in-chief. By 1923, he was already the most influential of all Guangxi warlords, thus he was courted by Sun Yatsen; he joined the Nationalist Party by Oct that year. Between 1924 and 1925, with the support of Nationalist forces, he defeated the last of the remaining political opposition in Guangxi and became the province's military governor. 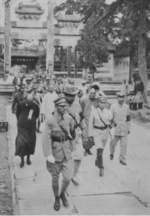 In Mar 1926, his men was formally organized under the Nationalist government as the 7th Revolutionary Army for the Northern Expedition, in which war he captured the city of Wuhan in 1927 and Beijing-Tianjin area in Jun 1928. In Jan 1929, Chiang Kaishek attempted to consolidate all military power under him, which soured relationships with warlords previously in support of the Nationalist Party, leading to Li's break from the Nationalist Party. He was deemed a traitor to the party. This attempt by Chiang led directly to the Central Plains War in which Li's Guangxi forces captured Yueyang but was eventually out-maneuvered by Chiang. In Nov 1931, Japanese aggression in northeastern China brought many of the warlords together, including Li, who was granted party membership again in Nov 1931. In Apr 1935, Li was promoted to the rank of general in the Chinese Army. ww2dbaseAfter the Second Sino-Japanese War began, Li was named the commander of the 5th war area, taking leadership role in the Battle of Xuzhou. He participated in the Battle of Wuhan in Jun 1938, Battle of Suixian-Zaoyang in Apr and May 1939, the Winter Offensive of 1939 to 1940, and Battle of South Henan in Jan and Feb 1941. In Sep 1943, he was named the Director of the Generalissimo's Headquarters with direct command over the first, fifth, and tenth war areas. British historian Jonathan D. Spence thought Li "fought a brilliant battle [at Xuzhou], luring the Imperial Japanese Army into an trap and killing as many as 30,000 of its combat troops" in 1938.
ww2dbaseAfter WW2, Li lost influence in the military, but assumed more political roles. On 28 Apr 1948, he was elected the Vice President of China by the National Assembly under President Chiang Kaishek who had won the presidential election five days earlier. On 22 Jan 1949, he was Acting President of China per terms of the Chinese Constitution of 1947 due to Chiang's resignation in protest against the Parliament's inability to curb Communist uprisings. As the Acting President, he attempted to negotiate with the Communist leaders in Beijing, but the negotiations came to little fruition, and he was deemed a weak leader for opening talks with the Communists by Chiang's supporters. In Apr 1949, the capital of Nanjing fell to Communist forces, and Li organized the withdraw of the government to Guangzhou in Guangdong Province. After disagreements on how to carry on the Civil War, on 20 Nov 1950, with the excuse of his declining health, he took a flight from Nanning, Guangxi to the United States via Hong Kong. He visited US President Harry Truman and denounced Chiang as a "dictator". On 1 Mar 1950, Chiang assumed the presidency of China from the temporary capital of Taipei, Taiwan, thus ending Li's term as the Acting President; he was further impeached of his Vice President title by Chiang's orders in Mar 1954. Resentful of Chiang, Li became a Communist sympathizer and moved to Beijing on 20 Jul 1965. He passed away from duodenum cancer in Beijing in Jan 1969.
ww2dbaseSources: History of the Second Sino-Japanese War, Wikipedia. 3 Aug 1891 Zongren Li was born. 13 Jan 1969 Zongren Li passed away.